Michel Montecrossa’s New-Topical-Song ‘Bob Dylan Is Right – Bob Dylan Hat Recht’, released by Mira Sound Germany on Audio-CD, DVD and as Download, was written to take a stand for protecting the right to intimacy of an artist’s live-performance and its preciousness of unfoldment which need not be surrounded and constantly disturbed by a crowd of cameras and handys. Bob Dylan demanded this right during his concert of 16th April 2019 in Vienna and Michel Montecrossa’s New-Topical-Song ‘Bob Dylan Is Right – Bob Dylan Hat Recht’ sings about it. Michel Montecrossa’s New-Topical-Song ‘Bob Dylan Is Right – Bob Dylan Hat Recht’, veröffentlicht von Mira Sound Germany auf Audio-CD, DVD und als Download, wurde geschrieben um sich dafür einzusetzen, dass die Intimität der Live-Performance eines Künstlers und deren Entfaltungswert beschützt wird, die es nicht nötig haben, fortwährend durch eine Horde von Kameras und Handys belästigt und gestört zu werden. Während seinem Konzert vom 16. April 2016 in Wien forderte Bob Dylan dieses Recht ein und Michel Montecrossa’s New-Topical-Song ‘Bob Dylan Is Right – Bob Dylan Hat Recht’ singt darüber. Bob Dylan is right / when demanding respect / for the value of / his performance work. Bob Dylan hat recht, / wenn Respekt er verlangt / für den Wert seiner / Performance Arbeit. The uniqueness of a song / shines brightest by staying / unique and a / one-time happening. Das Besondere eines Liedes / wird am hellsten leuchten, / wenn es besonders bleibt, / das Einmalige bewahrend. The live-work of a / performing artist is / to bring to the audience / again and again this unique magic. Die Auftrittsarbeit eines / vortragenden Künstlers ist es, diesen / Einmaligkeitszauber den Leuten / immer wieder zu bringen. Michel Montecrossa’s New-Topical-Song ‘Aus Den Flammen Von Notre-Dame – From The Flames Of Notre-Dame’, released by Mira Sound Germany on Audio-CD, DVD and as Download, was written in the night of 15th April 2019 when in Paris the Cathedral Notre-Dame stood in flames, the central symbol of European Christianity, Culture and Unity. This tragedy shook the hearts and minds of millions of people in Europe and all over the world. Yet it not only brought sadness but also the strong emotion that looks towards the future with hope and energy to save and rebuild Notre-Dame and stand with renewed determination for the great cultural and spiritual values of European civilization. With this determination Michel Montecrossa wrote his New-Topical-Song ‘Aus Den Flammen Von Notre-Dame – From The Flames Of Notre-Dame’. “Aus Verlust entsteht Großes durch die Stärke des Vertrauens in die Zukunft der Liebe, des Guten und des Schönen. Aus den Flammen von Notre-Dame / sah ich erscheinen die Seele von Europa. / From the flames of Notre-Dame / I saw emerging the Soul of Europe. Ihr Herz der Liebe und Einigkeit / fühlte ich stärker als die Trauer. / Her heart of love and unity / I felt stronger than the sadness. Notre-Dame wird stark und leuchtend sein / und Europa wird stark und leuchtend sein / für die lebendige Feier der Menschlichkeit / auf der ganzen Welt – für immer. Notre-Dame will be strong and bright / and Europe will be strong and bright / for the Living Celebration of Humanity / all over the world – forever. 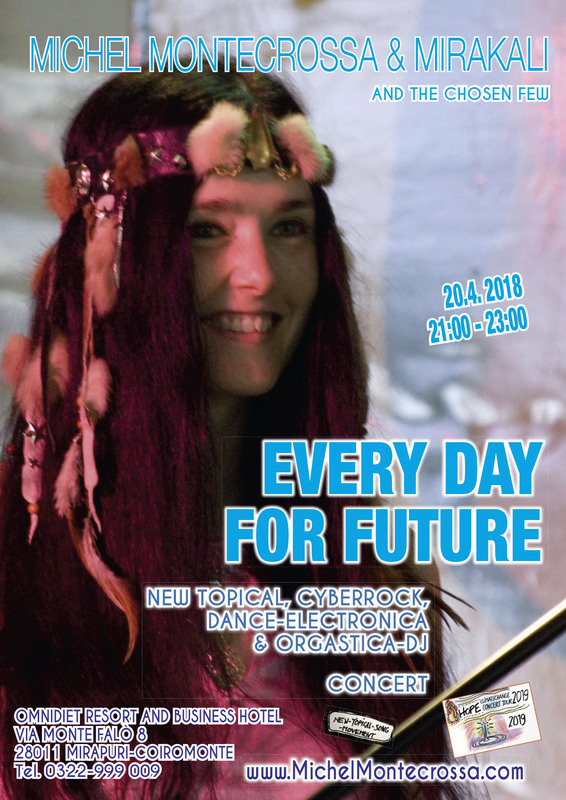 Presenting this week the 158th blog post of the ‘Hot Tracks’ series with a selection of songs by Michel Montecrossa and Mirakali. Image above: Michel Montecrossa & Mirakali live on stage at the Spirit of Woodstock Festival in Mirapuri, Italy (www.SpiritOfWoodstockFest.com), this year the Festival takes place from 31st July to 4th August 2019. 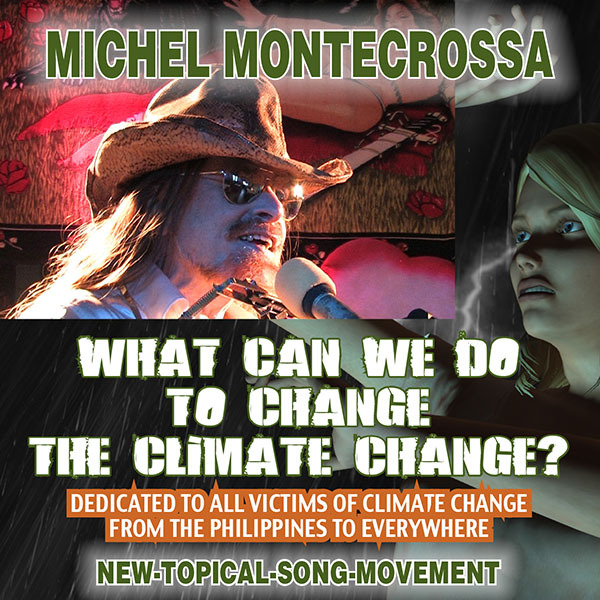 Michel Montecrossa’s New-Topical-Song ‘What Can We Do To Change The Climate Change?’, released by Mira Sound Germany on Audio-CD, DVD and as Download, is dedicated to Fridays for Future and Greta Thunberg and to all victims of climate change. Michel Montecrossa is the New-Topical-Song writer who founded Mirapuri – the City of Peace and Futureman in Europe, Italy as one of the most outstanding centers of action for changing the climate change. His song ‘What Can We Do To Change The Climate Change?’ is a poignant call to do the right thing for the future of the earth before it is too late. WHAT CAN WE DO TO CHANGE THE CLIMATE CHANGE? What can we do to change the climate change? / First thing for sure is consciousness change. / We must grow in awareness and practice habit change / that’s what we can do to change the climate change. What can I do to change the climate change? / First thing for sure is consciousness change. / I grow in awareness and lend a helping hand. / That‘s what I do to change the climate change. What can we do to bring the wrong to an end? / I say, let’s take the direction away / from doom and deadly games / towards deep understanding of truth and action / that’s what we can do to bring the wrong to an end. Consciousness growth is my evolving truth, / leads to love and vision free of egoism, / leads to wisdom of union and working together. / Yes, consciousness growth is my evolving truth. Climate change will change if we come together / to build places of green ways to handle the future / and learn to be human, peaceful and strong. / Climate change will change if it‘s that what we want. where love is the master and soul the key / to creation boundless and free, / where consciousness meets consciousness and sees, / ‘cause love is the master and soul is the key. where unity is true and young the drive / to find the good way of kindness bright / that is healthy and progressive, saves the climate and our life. / Unity is true and young change, I say, is right. This is Mirapuri, it’s my pounding life. / It’s my message of encouraging love and light / of a better world ending climate change night. / This is Mirapuri, well, it‘s the helping might. And what can I do to change the climate change? / First thing I know is consciousness change. / I grow in awareness and lend a helping hand. / That’s what I do to change the climate change. Posted in Acoustic / Unplugged, art, Art Photos / photos of paintings, ‘Love & Hope’ Climate Change Concert Tour 2019, Climate Change & Environment, Climate Song, Concert Videos / Konzertvideos, Cover Art / Poster Art, Cyberrock, eco-musician, Global Warming, Kunst, Literature / Cyberpoetry, Live Concert, Love, Messages & Quotes, Michel Montecrossa, Michel Montecrossa Art, Michel Montecrossa Music Styles, Michel Montecrossa Songtexte, Mirapuri & Miravillage, Movie / Video, movie art / videoart, Neuerscheinungen & News, Posts, Rock-Cinema, Social Climate / Climate Change, Song & Lyrics Spotlight, song lyrics	Tagged Climate Change, earth, Fridays for Future, Global Warming, Greta Thunberg, Michel Montecrossa, Mirapuri, Movie, Music, New-Topical-Song, What Can We Do To Change The Climate Change? ‘Talking Turkey & The E.U. – Über Die Türkei & E.U. Reden’, released by Mira Sound Germany on Audio-CD, DVD and as Download, is Michel Montecrossa’s New-Topical-Song apropos Turkey joining the EU. In his song Michel Montecrossa sees Turkey as the big bridge to Eurasia and sees that with Turkey joining the EU the door is open for great Eurasia business, opening a new dimension of trade, prosperity and peace culture for the EU, Turkey and the Middle East. Michel Montecrossa wrote this song as a mature answer to the childish Polito-Kindergarten-Game of insulting each other and thinks that it is better now to say ‘sorry’ and rather do what is really needed: to open new ways of peace for the Kurds and Turkey, to save all the refugees and to change the Middle East into a world of peace by building the big bridge between EU and Turkey for creating a united Eurasia of free trade and free associations for a better tomorrow of the greatest continent on earth. “I wrote the New-Topical-Song ’Talking Turkey & The E.U. – Über Die Türkei & E.U. Reden’ at a time when the EU and Turkey had nothing better to do than to insult each other and to make the big show of political Kindergarten. What I have to say is that Turkey must join the EU so that trade, prosperity and peace culture can grow on the way to a strong Eurasia. Stop all useless insults and get to the table! New ways then can open to change the Middle East into a world of peace. Time it is to talk about the E.U. and Turkey. / Zeit ist es, über die Türkei und E.U. zu reden, / For Turkey is the big bridge to Eurasia. / Denn die Türkei ist die große Brücke nach Eurasien. With Turkey joining the E.U. / the door is open for great Eurasia business. / Mit der Türkei als E.U. Mitglieds Staat / ist das Tor offen für große Eurasien Geschäfte. A new dimension of the E.U. then opens, you know, / Eine neue Dimension der E.U. zeigt sich dann / Of trade, prosperity and peace-culture strong / Des Handels, des Wohlstands und Friedenskultur stark. New Ways can open then of peace / for the Kurds and for Turkey. / Neue Wege des Friedens können entstehen / für die Kurden und für die Türkei. New ways can open to save all refugees / and to change the Middle East into a world of peace. / Neue Wege können entstehen, zu retten alle Flüchtlinge / und zu wandeln den Mittleren Orient in eine Friedenswelt. Image above: Michel Montecrossa & Mirakali live on stage at the DreamSpace Electronica Fest at the Spirit of Woodstock Festival in Mirapuri, Italy (www.SpiritOfWoodstockFest.com), this year the Festival takes place from 31st July to 4th August 2019. ‘Festival Of Love & Hope’ Michel Montecrossa’s Audio Single and DVD, released by Mira Sound Germany, for announcing the Spirit of Woodstock Festival 2019 in Mirapuri, Italy. Michel Montecrossa & Mirakali together with their band The Chosen Few during five days (31st July – 4th August) present 10 concerts featuring brand-new songs from Michel Montecrossa’s & Mirakali’s ongoing Cyberrock, Electronica-Dance, Cyberschlager, Orgastica-DJ, Cyberpoems and New-Topical-Song concert tour. Michel Montecrossa, Mirakali and their band The Chosen Few play along with international guest bands for Love & Hope at the most important European Free-Music-Revolution-Festival. My enchantress is a girl, Mirakali is her name. I laughed, “You’re looking cute!” “So are you,” she said. She had the bright white teeth and the charming smile. for the Love and Hope Revolution. the Festival of Love and Hope for all. in Mirapuri where Love and Hope are strong. Mirakali is the girl with the woman drive. She is popular with all that’s flyin’ high. She has the heaven smile and her aroma is fine. And now I hear her music, see her starlight sky. the life of Love and Hope that smiles. with music and poems and songs of the strong. that we all dance together as the world made one. for this world we are livin’ for all time to come.